Looking for hotels near IFSC? Featuring free WiFi throughout the property, Woodville B&B offers accommodations in Bray. Free private parking is available on site. The rooms have a flat-screen TV. Located in Bray, Pat's B&B provides accommodations with free WiFi. The accommodations has a shared spa bath available for stays of 3 nights of more. Located in Enniskerry, a 6-minute walk from Powerscourt House, Gardens and Waterfall, The Enniskerry Inn provides a garden and rooms with free WiFi access. 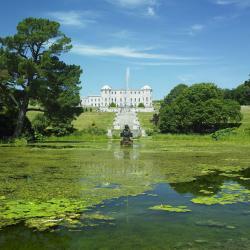 On Ireland’s beautiful east coast, Powerscourt Hotel is a 5-star hotel tucked away in the woodlands of County Wicklow. Located in Bray, Claremount is 984 feet from National Sealife Aquarium. Bray Heritage Center is 2625 feet away. Free WiFi is available. All units have a seating and dining area. Featuring a terrace and a shared lounge, The Strand Hotel former Home of Oscar Wilde & Caffe Vergnano 1882 is located in Bray, a 16-minute walk from National Sealife Aquarium. Featuring a terrace and a shared lounge, The Strand Hotel former Home of Oscar Wilde & Caffe Vergnano 1882 is located in Bray, a 16-minute walk from National Sealife Aquarium. Staff were fantastic. Great views from room and restaurant balcony. The boutique Beacon Hotel is located in Sandyford, South Dublin, just off the M50, and features My Thai Restaurant. The bed was amazing, super big...luxurious bathrobe’s per person, it’s fabulous. Horse & Hound is located in the historic Delgany village at the foothill of the Wicklow Mountains, 14 mi from Wicklow Jail and 11 mi from Usher Court Gardens. Guests can enjoy the on-site bar. Room was lovely and very clean. Nice decor and comfy bed.